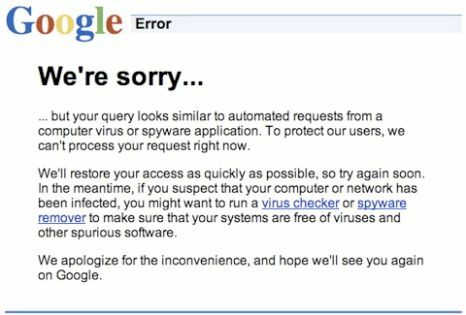 Sometimes when using various Google services such as Google search engine to search the web or Google Translate to translate text or web page to your native language, you may occasionally encounter a Google Error message which saying “We’re Sorry” with the following text. … but your query looks similar to to automated requests from a computer virus or spyware application. To protect our users, we can’t process your request right now. The symptom appears to happen when you’ve over-utilize or overuse the Google service or server, or Google has detected that the system network IP address that you’re currently using has been trying to abuse Google service knowingly by trying too many times too fast, or unknowingly by malicious software on your computer. In any case, you won’t be able to use main Google sites for a period of time. When Google ban your IP address, usually the ban will last for about 24 hours. So the solution for this particular Google Error is to wait after 24 hours and try to use Google service again. If you need to access and use Google immediately, the workaround is to try to use your ISP proxy server to access Google (or if you’re currently using proxy server to surf, try to remove proxy and use direct connection to Internet instead). You can also try to use a web proxy service as used by many to access blocked MySpace (now defunct) or visit access restricted website.